I run because I want to, I love it and I can. There’s an endless amount of ways to challenge yourself in running. 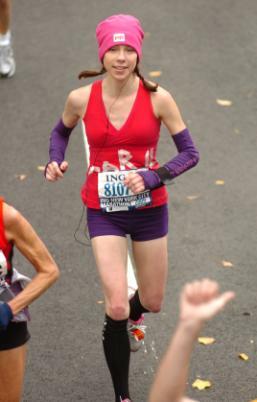 Boston 2008, it was my second marathon and it’s still the best race I’ve ever had. The weather was perfect, I saw my family at 5 different mile markers, the crowd was amazing and I felt good the entire way. I was aiming to do just as good as I had at my first marathon but ended up PRing by 13 minutes. There’s really no better feeling than helping someone achieve a hard earned goal. I’m definitely a talker on runs so will have no problem keeping you distracted from dwelling on how many more miles are left to run. 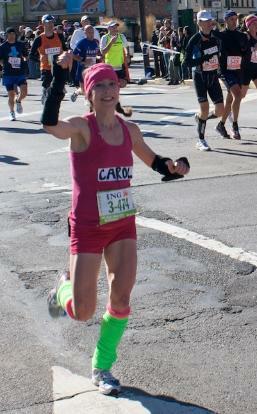 I’ve had so many fun marathon experiences I want to make sure others do as well. I lead a run group with another friend for Icebreaker two nights a week.